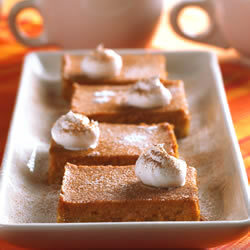 Rocky Mountain Lodge & Cabins’ Recipe of the month is perfect for your fall baking. Do you like Pumpkin Pie? Then this is the recipe for you! It’s a simple, easy recipe, and goes a long way. This entry was posted in Uncategorized and tagged Dessert Recipes, Holiday Recipes, Pies and Pastries by Debbie Reynolds. Bookmark the permalink.